Yes, I know! Two posts in one day. I got a small patch of crafty time today while my son played with his trucks and my daughter took a nap. I kept this one pretty simple, but I love the colors and the stamp makes me dream of the beach. I am entering this card in several challenges. Supplies are image and sentiment from Raisin Boat colored in with SU watercolor pencils, softened with Blender pen, and highlighted with Stickles and a glitter pen. Scalloped border is a SU punch. Buttons are PTI and ribbon is from my stash. Paper is SU Creamy Caramel, Certainly Celery and Close to Cocoa. The cream paper and striped paper is DCWV. Thanks for stopping by again! Please check out the main page - I have some blog candy that ends Wednesday, and scroll down for another post from a little bit ago! How cute! I really love that border punch you used, and the buttons are a great little addition. Glad you could play with us at Cardabilities! Too cute! 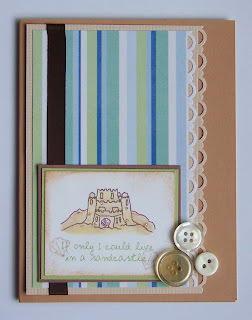 I love the buttons and the border! Very cute! Love the colors you used! Ooooh, I love this card! The colors are perfect for the beach. Such a great sentiment!! such a wonderful take on the cardabilities sketch! I love your choice of colors! awesome take on the sketch...:) love the simplicity of your card! :) Thanks for playing with us at Cardabilities! This is adorable...I love the color combo! Oh so pretty, the buttons are the perfect embellishment here! ooh, love the addition of the buttons! I love your name too, its my mothers name. thanks for playing! What a pretty image-I love the soft colors you used to go with it. So glad you could join us at Cardabilities! Pretty.. love the double scallopped border.